Graphical application for field and well structural data evaluation and processing. Easy to use Graphical User Interface, data processing takes just a few clicks. 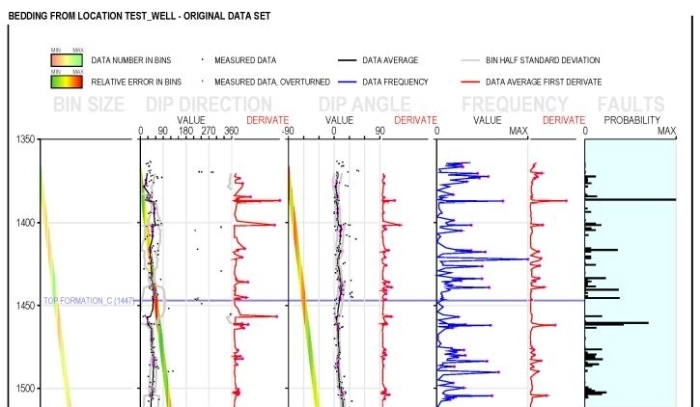 Separate processing and plot for different wells, localities, data types, data groups and formation. 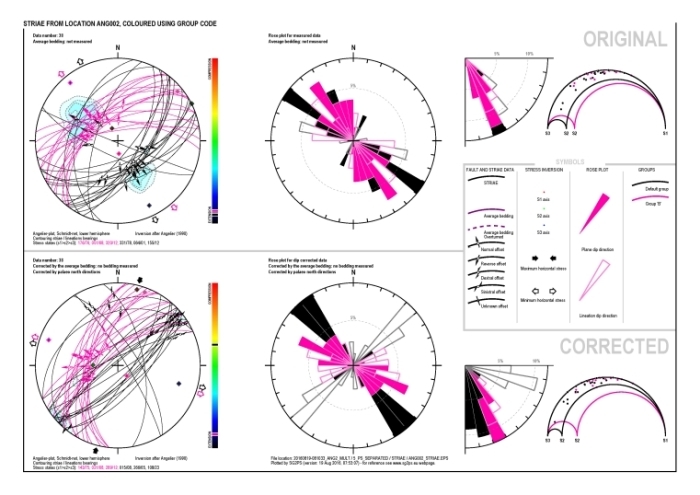 Displays well structural data on well plots, and field data on stereonets and rose diagrams. Tectonic transport direction display and mean transport direction calculation. Displaying multiple data groups on the same stereonet. Bedding correction for tilting test available. Trajectory correction for borehole data is supported. K-means clustering to identify data groups in an inhomogeneous data set. Eight different inversion methodologies and fracture geometry statistics. Data input in Excel or any other spreadsheet application of your choice (such as OpenOffice or Gnumeric). Output in Adobe Portable Document Format (PDF) for individual files, and a single merged file. Optionally, Encapsulated Post Script (EPS) is also available as output format, useful for publications. Both output options are possible in grayscale as well (ideal for gray scale publications). Average calculation for structural trends: average feature dip direction / dip angle calculation along well bore using fix data number bin or fix interval bins. Standard deviation and relative error calculation for the processed bins. Derivate curve to show out-of-trend zones: investigation of out-of-trend zones using first derivate curve of the average and frequency curves. Peak detection for deformation zones: changes on average, frequency and derivate curve can indicate a zone of deformation. Faults probability: abrupt change in feature geometry and/or frequency can indicate a zone of deformation. Using changes both of average and derivate curve, and reliability of those changes, probability of fault zones can be predicted. Angelier or Hoeppner plot, Schmidt or Wulff net, upper or lower hemisphere projections are possible. Symmetric / asymmetric (bidirectional / unidirectional) rose diagrams with different bin size are available to plot dip direction or strike of data. Contouring data set using four different possible inputs. Slickenside data correction on two different ways. Full automatic data processing option. Average data (e.g. average bedding) calculation using regression. Simplified data input and auto completition of input database. Bingham directional statistics for fracture sets. RUP and ANG stress estimators display, and slickenside clustering using them. Resolved shear direction display on stereonet. Stress state display on Mohr circle.